While my husband has just over a year left of grad-school we are already discussing ideas of where we would like to move to and the type of space that we would like to move into in the years to come. Our dream is to find a small space, anywhere between 1,000 - 1,500 square feet on the out-skirts of a city. Homes like these are hard to come by in the age of McMansions however we've got our fingers crossed. After living in our current apartment for the past three years we have found that we really enjoy living small. The space that we're living in now (1,031 sq ft) seems almost too large for us as we've continued to minimize our possessions. We are aware that the potential addition of children may change things though so we're shooting for 1,500 sq ft or under. There are many benefits to living small such as less to clean, less maintenance and thus more time, more money, more energy, and less stress. However living small can have its challenges. If its an older home (aka there's no open concept plan) rooms can sometimes feel choppy, dark and closed off. These problems shouldn't be a deal breaker though! If you have the funds and a great design team you can always tear down a wall or two to open a space up. If that's in the cards for you though I have written some tried and true tips for how to make a space feel larger. The addition of mirrors to a small space is one of the best known secrets the room appear larger. Not only do they add a nice designer touch but they reflect sources of light whether that be interior or natural light. Leaning a large floor mirror against the wall is always a chic, edgy choice. Before moving into my own place I had every intention of painting every room in my apartment so that none of the walls would be white. I had for years dreamt of painting my living room olive green, my dining room brown, and my office black. I loved the drama and depth of these colors, and still do; however I have grown to love our white walls, that we simply kept. Our apartment is dark enough without the help of dramatic paint colors. I've found that not only does it feel lighter and happier painted white but larger as well. Avoid anything whether it be furniture or wall art, that makes a space appear choppy. 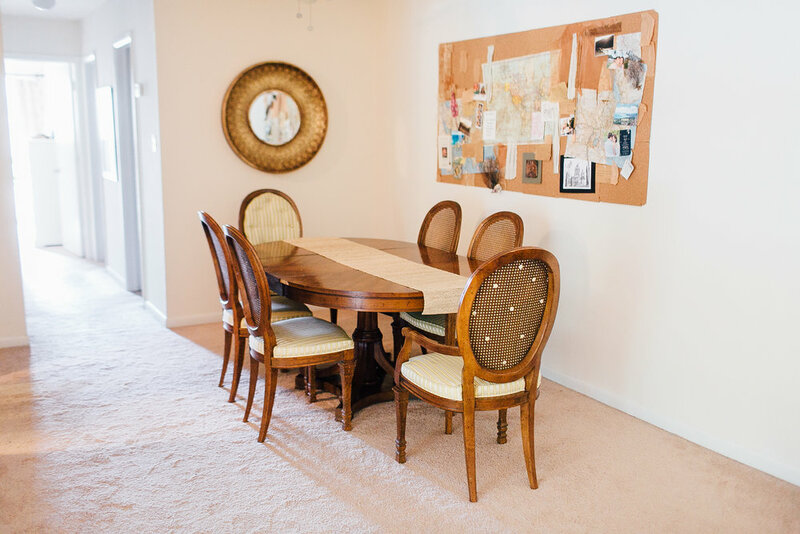 When my husband and I first moved into our apartment I did not have a clear plan for the look or design of our space. Gallery walls very popular and so I decided that I would make my own. Now while I love a good gallery wall, this particular one was just too choppy. The frames were dark and small. They just broke up the wall in a weird way. Furniture can to do the same thing when arranged in a way that is fighting the design or architecture of a room. I never realized how the use of rugs can make a space feel smaller until I began to work with clients of my own. I would walk into their homes and notice that either there were a lot of rugs all over the place or rugs in the wrong places, resulting in the room appearing much smaller than it really was. 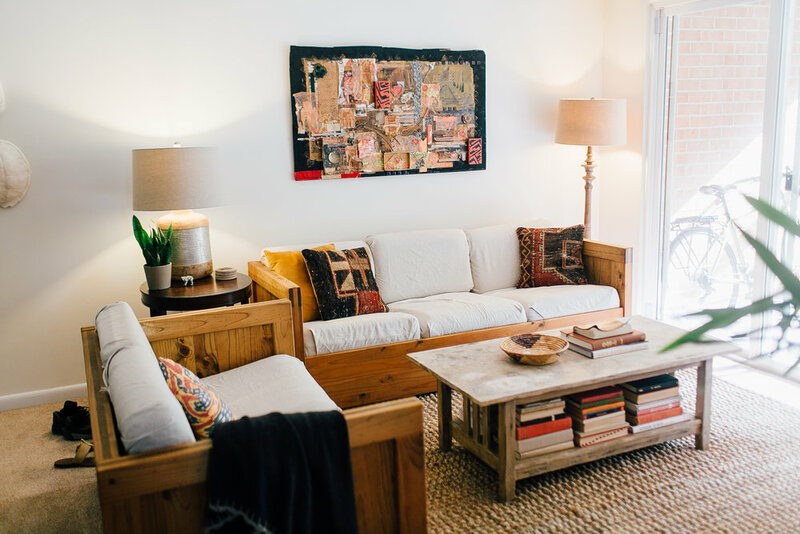 While I love a good rug along with the layering of rugs (ahem), I believe that it must be done intentionally. Okay, you can have some dark furniture but it should be minimal. Similar to the white walls having light-colored furniture tricks the eye into making a room feel larger than it really is. This is a trick that I learned while working in retail. My boss explained to me once how a space appears much cleaner, orderly, and larger if there are not a lot of items on the ground. Its okay to have a few decorative items such as a tree, basket, floor pillows, or a stand however the cleaner the floor space, the larger the room will feel.